Home | Blog | Uncategorized | Who’s Egg is it Anyway? Once upon a time, on a small homestead in rural America, chickens roamed freely in the yards of our grandparents and great grandparents. This practice is making a resurgence with the popularity of homesteading and backyard coops. When we [Animal Advocates of ScPA] are at local events, we are often asked what we vegans think about eating the eggs of these backyard hens. This question gives me pause. I find myself questioning that the return to a kinder, gentler time may be what we really need in these fast-paced and often insular times. The idea of living off the land, growing my own food, and living a clean existence not dependent on large-scale farm operations is very attractive to me. There are many factors that would influence our society to live the way our ancestors did and return to a life before factory farms and mono-cropping. Would it be possible to change the minds and hearts of everyone and return to a time when convenience and consumerism did not reign supreme? I remain often hopeful, but I know that it is going to take years of work to convince others that plant-based clean living is an attainable and worthy endeavor. I appreciate the spirit of homesteading, but I have to disagree with the use of animal agriculture in any form. dominion over any other living being or take from them what is not ours to take. This is a difficult reality to embrace for most because we were raised to believe that humans are superior to all other species. The non-use of farmed animals is the aspiration of all vegans. 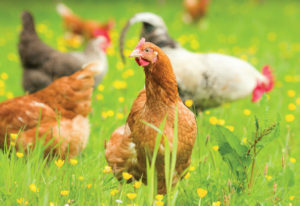 People are often led to believe that “free-range” and “cage-free” mean happy chickens, pecking away at the ground in a green pasture while feeling the sun on their backs. 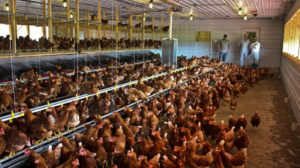 Almost all hens raised for egg production live out their short lives in cramped and feces-filled cages or giant sheds, where they have their beaks clipped so they cannot peck at their fellow hens who fight for space to move their legs and wings. The reality of the incredibly short lives of these chickens is so very sad and deplorable. When it comes to the question of the use of the eggs that come, not from the aforementioned farms, but from family homes where the chickens are loved and nurtured, my response is thus: Whereas these chickens have happier lives, we are still encouraging the use of hatcheries and the egg/poultry industries to give us these chickens. This means that, even if you raise them and treat them with respect and kindness, they are still genetically bred to overproduce eggs, which takes a heavy toll on their bodies and wellbeing. Also, the fundamental use of their eggs for consumption actually normalizes the eating of eggs. As an example, if you eat the eggs of your backyard chickens, it is probable that you are more likely to eat eggs and egg products at restaurants who procure their eggs from factory farms, thus continuing the cycle of exploitation and abuse of gentle sentient beings who deserve a much better life. The beautiful Mary Margaret, a hen who you may visit at Lancaster Farm Sanctuary. She was brought into the world to produce more eggs than her body can handle but because of some very kind people, she is living her life free of exploitation. We can dream of a day when the phrases “free-range” and “cage-free” actually mean what the terms suggest, but, until that day, we humans need to protect, provide sanctuary, and speak out for those who cannot speak for themselves. This is just the tip of the iceberg in terms of how “humane” eggs are produced and the conditions of the chicks, hens, and everything in-between. There are many wonderful, informative articles regarding this topic on the internet. 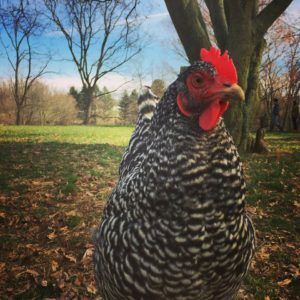 Bite Size Vegan: Can Vegans Eat Eggs from Backyard Chickens? VEGGans? The Vegan Woman: Is It Ethical to Eat Eggs from Home Grown Chickens?